Markets were down last week as investors favored lower risk sectors like Consumer Staples and Utilities companies. Unlike the headlines we see in the press, the current market volatility is normal. As evidence of this, we do not see a broad-based move into safe-haven assets like gold or Treasuries. We believe markets will improve as we move into the third quarter’s earnings season. For long term investors, stick with the game plan. Ultimately, stocks will follow earnings. Many foreign stock indices are decreasing, diverging from US markets. The past week saw markets sell off and investors respond by reducing their risk exposure. 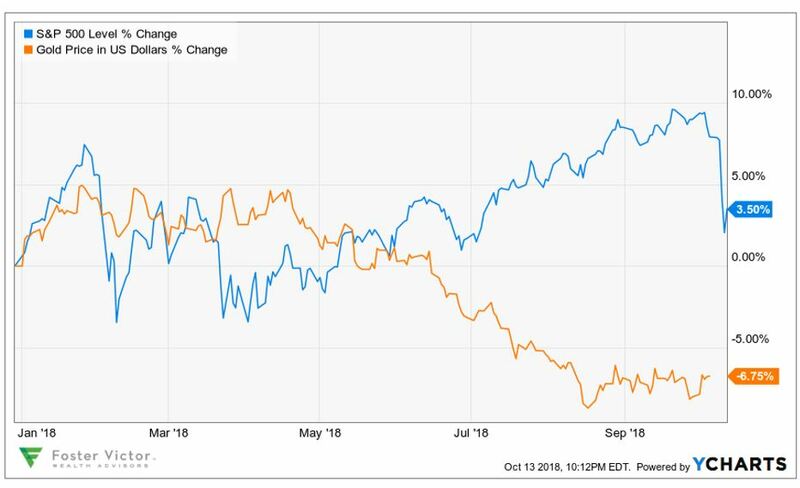 While FAANG stocks (Facebook, Amazon, Apple, Netflix and Google) and other technology names drove the market forward in 2018, we saw investors cycle out of these stocks into lower risk assets such as Utilities and Consumer Staples companies. Large cap stocks were favored relative to riskier small cap stocks. Perspective is important when we come to this time of year. The three-month period from August through October historically exhibits the highest volatility each year. Since 1990, this period has produced the lowest average return. Despite the current turmoil, seasonal weakness is widely anticipated by investors and should be considered normal. First, safe haven assets are not behaving like safe haven asset right now. For 2018, gold is down 6.75% for the year even as the S&P 500 has risen 3.50%. If the world was ending, we’d be seeing investors pile into gold.Even though everyone knows this, it doesn’t stop pundits from predicting the end of the world. The leading headline on MarketWatch last weekend was “The Stock Market’s Nightmare may be far from Over.” The financial press certainly does its best to provoke investor angst. We think some context would be helpful. Along with the “flight to safety” theme is the trend in interest rates. The modest retrenchment in Treasury yields we saw mid-week did little to counter the upward trend in rates we’ve seen this year. In a broad retraction of risk, bond yields would be falling however Treasury yields continue to rise. 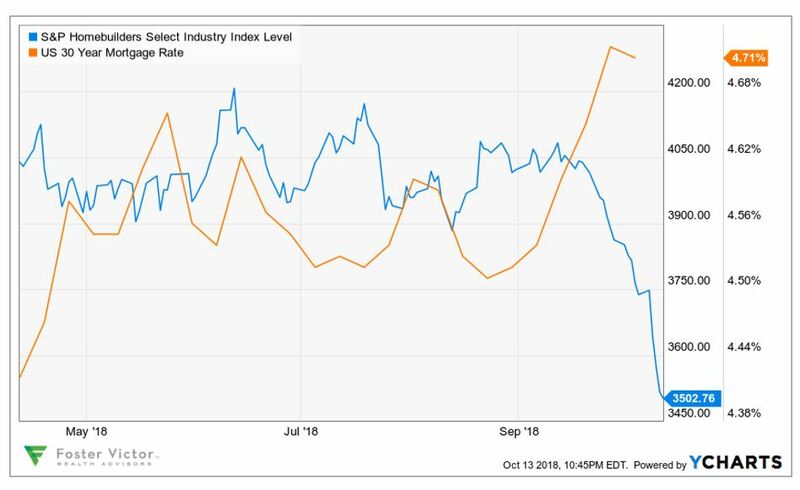 Rising yields are generally an indicator of stronger demand for capital – hardly a sign that markets are about to crash. 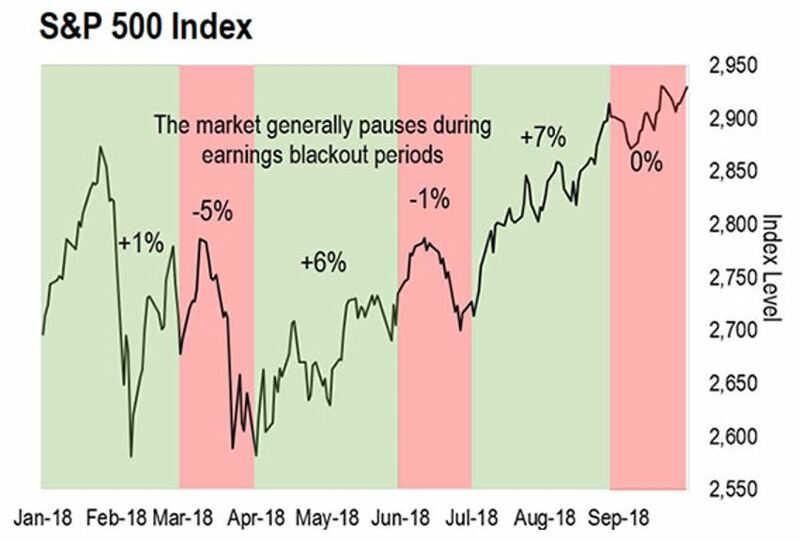 Third, stock markets tend to be soft during earnings blackout periods when company news drops off. This year has been no different. Now that earnings season has started, we hope to see market conditions improve. 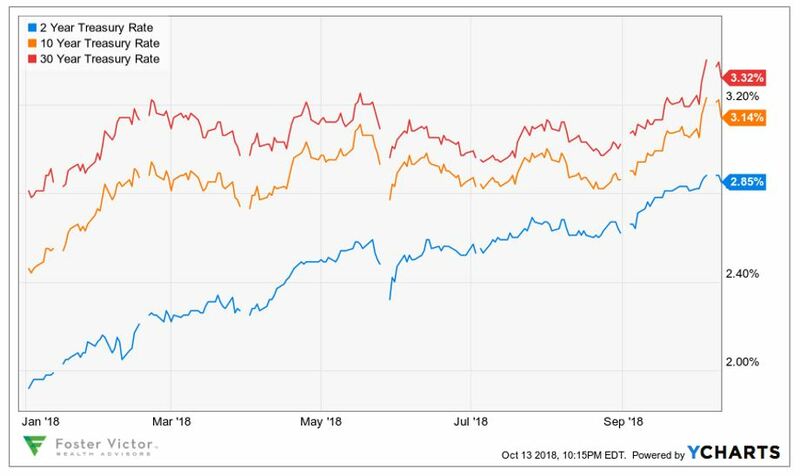 Of the companies that have reported for the September quarter, 68% have reported better than expected sales, well above the 5-year average of 59%. However, this was not true of companies in the Consumer Staples sector. The irony? Some investors moved into “lower risk” Consumer Staples stocks at a time when these companies are reporting mixed results. There are, however, some market internals that suggest that investors are reducing their risk exposure. Investors see higher interest rates impacting rate sensitive parts of the economy. Homes are more affordable when interest rates are low, so it shouldn’t surprise us when Homebuilders sell-off even as mortgage rates rise. International markets are performing poorly. Foreign markets tend to be more exposed to export markets than we see here in the US, so the US-China trade war isn’t doing them any favors. Still, we don’t tend to see such divergent performance between markets. Clearly, investors are discounting bad news in foreign markets. Will these issues seep into the US economy? It’s too soon to say. We believe returns from US stocks will be less than spectacular for the remainder of 2018. However, there are no leading indicators suggesting outright trouble ahead. The best thing we can do is to turn off the doomsday prognosticators and focus on fundamentals. 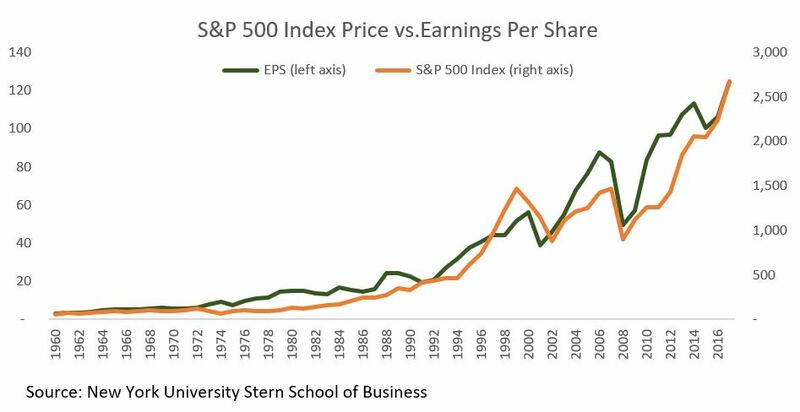 Ultimately, stock prices will respond to earnings.